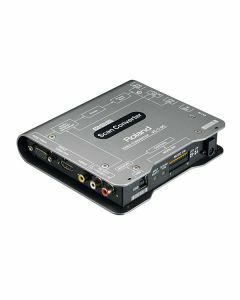 Roland's new video converters address the demand for high-quality, lossless video and audio converters for live/post production as well as installed systems. The VC-1-SC is a HDMI/SDI Up, Down, Cross Converter with frame sync. *When frame synchronizer is engaged, CH 3-8 of HDMI and CH 3-16 of SDI audio output are not available. Frame Synchronizer: Frame sync is activated when a reference signal is detected. When frame synchronizer is engaged, CH 3-8 of HDMI and CH 3-16 of SDI audio output are not available. Weight: 500 g/1 lbs. 2 oz.